A union jack which was manufactured in error before being flown in Manchester on Remembrance Sunday and Armistice Day has been removed. Manchester City Council has apologised for the blunder which saw the flag flying over the city's Central Library, close to its Cenotaph. It said the manufacturers cut the flag in the wrong place, leaving the diagonal crosses facing outwards. Contractors then failed to spot the error as the flag was being attached. 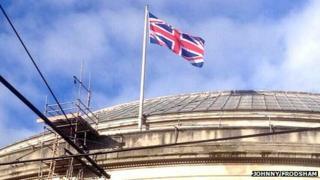 The flag was ordered in time for the service in St Peter's Square on Sunday. A council statement said: "This was clearly a mistake and we apologise. The misprinted flag will be replaced."